Ever craved a good ol’ piece of roast duck with glistening crispy skin and tender, soft and juicy meat? Well, you’ll certainly get that (and much more) here at Duckland, TungLok Group’s latest speciality restaurant. 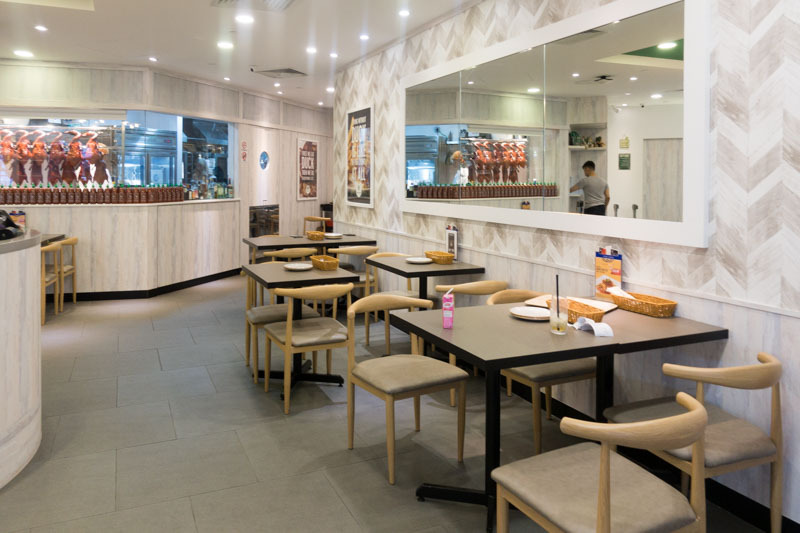 Located in the basement of United Square Shopping Mall at Novena, this casual eatery’s pride and glory are its unique Irish ducks, which are specially bred at Silver Hill Farm in Ireland. Just how special are these Irish ducks? These birds are an exclusive hybrid between Peking and Aylesbury and they’re raised in a 5km-radius farm in a temperature-controlled barn. They’re fed wheat, maize and soy, and only drink spring water. The minute I walked in, I immediately noticed the line of gorgeously roasted ducks hanging in their kitchen, waiting to be carved for the next meal. It’s definitely a sight to behold. The restaurant’s seating is spacious and clean, with large mirrors lining the walls to give an illusion of a larger space. Aside from seats located within the restaurant, there’s also al fresco seating if you prefer dining outdoors. 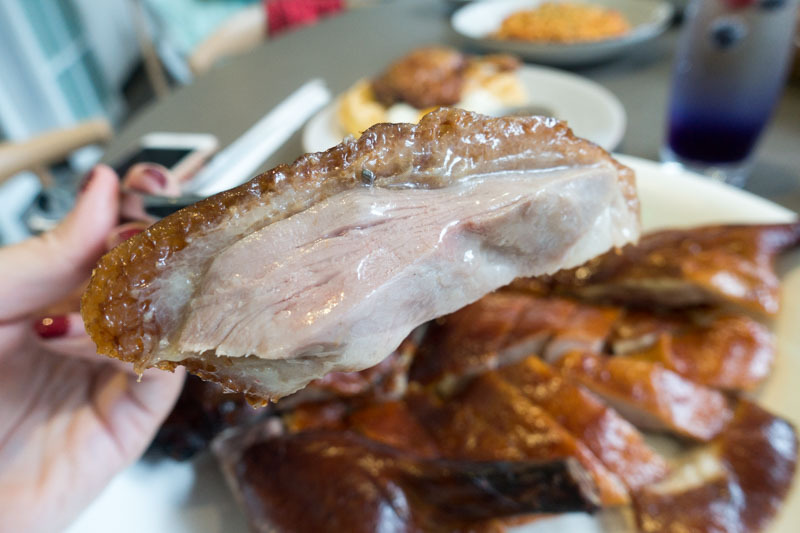 The Roasted Irish Duck (S$50 for whole duck, S$28 for half duck) is Duckland’s signature dish and is even labelled the “Best Duck In The World”. 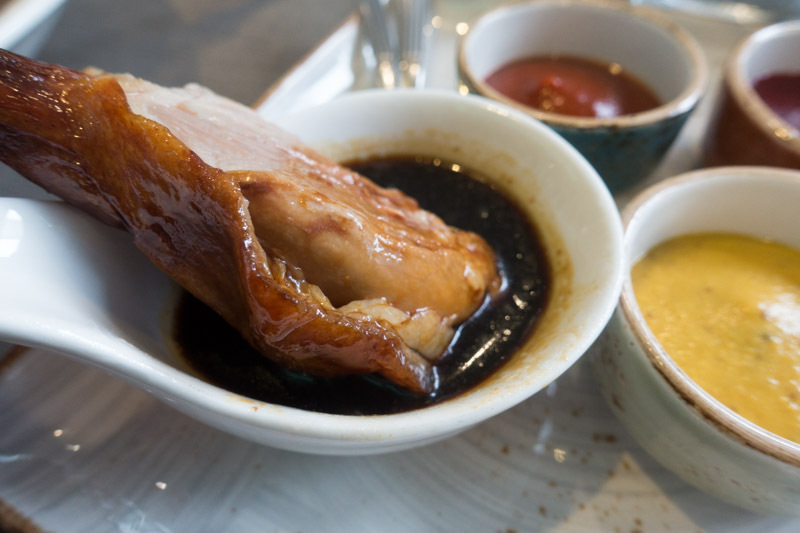 Marinated with herbs, spices and wine, and then roasted in a combi-oven, the duck is served with a variety of dipping sauces, such as raspberry sauce, calamansi chilli, yellow mustard and soy sauce. 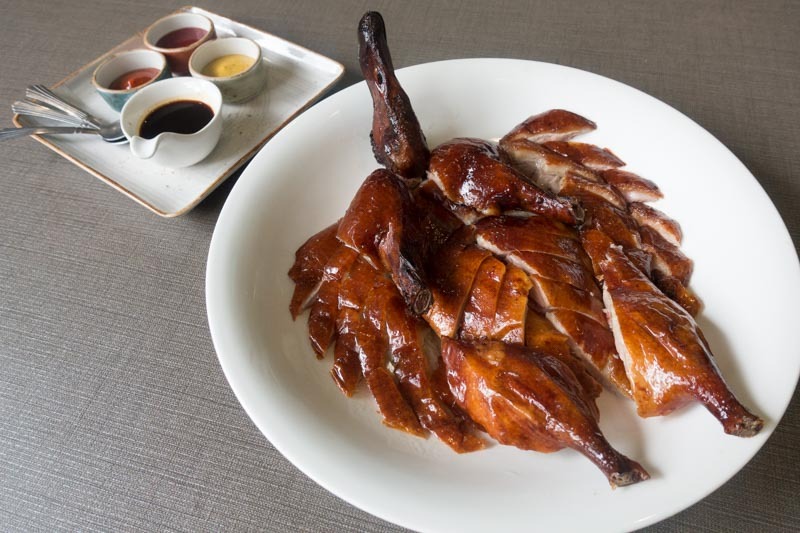 Should you prefer to have some carbs to accompany your duck, you can also add S$2 for a plate of steamed duck rice. Believe me when I say that the duck was as delicious as it looks. The meat was melt-in-your-mouth tender while the skin was roasted to a glorious thin crisp. There was a good meat-to-skin ratio, as well as a layer of thin fat that coated my tongue the minute I placed it in my mouth. I could tell how different this duck was the minute I bit into it — there wasn’t any gamey aftertaste at all and the meat itself was soft and juicy. My only gripe was that after some time, layers of glistening oil and fat lined the duck meat and made me feel jelak really quickly. Here’s my tip: if you can, polish off the entire plate while it’s still piping hot. I was torn between the soy-based and yellow mustard dipping sauces, and ended up alternating my duck in both of them. The soy-based sauce was piquant and sweet, tasting just like regular soy sauce, but with flavours like brown sugar and mirin. The yellow mustard, on the other hand, was tangy and sour. I was glad for the acidity, as it cut through the meat and whetted my appetite. 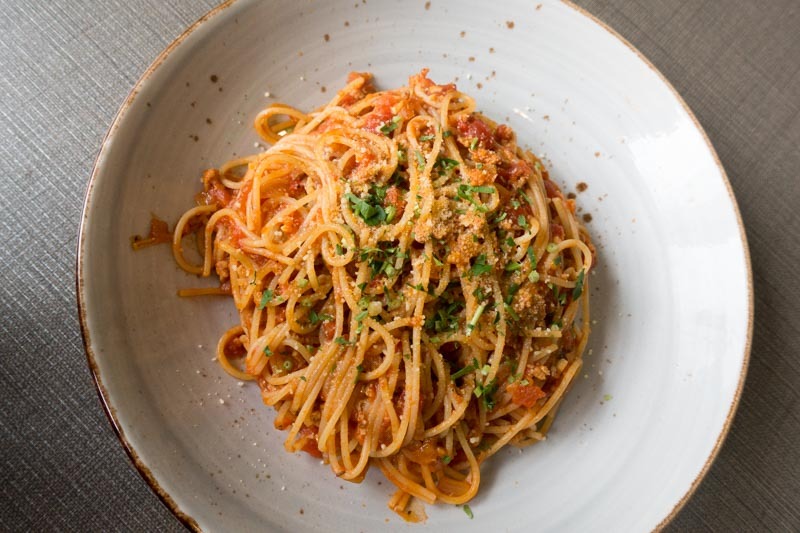 A twist on the classic spaghetti bolognese, the Spaghetti Duck Bolognese (S$13) came with hand-chopped minced duck and tasty home-made bolognese sauce. What I absolutely loved about this plate of noodles was how comforting, rich and rustic it was. The bolognese sauce was filled with robust flavours from tomatoes, onions and herbs, and the minced duck meat was tender and juicy. I also appreciated that the portions were huge. Not only was there enough sauce to coat the generous amount of noodles, but the entire plate of noodles was also enough to feed two people comfortably. If you’re expecting the taste of this classic pasta dish to change drastically just because Duckland used minced duck meat, you might be a little disappointed. It was certainly delicious, but I couldn’t taste the difference. To me, it seemed like a regular plate of spaghetti bolognese. 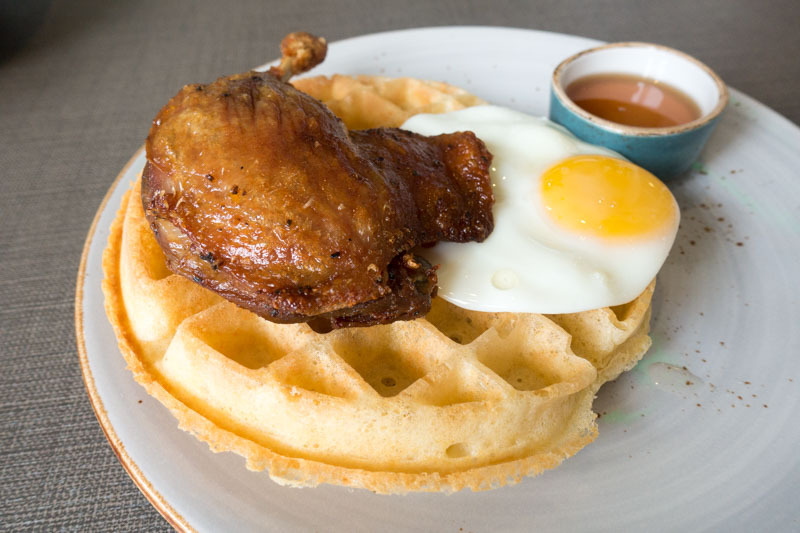 Londoners will be pleased to note that Duckland serves up a mean plate of Duck Confit & Waffle (S$20) too. 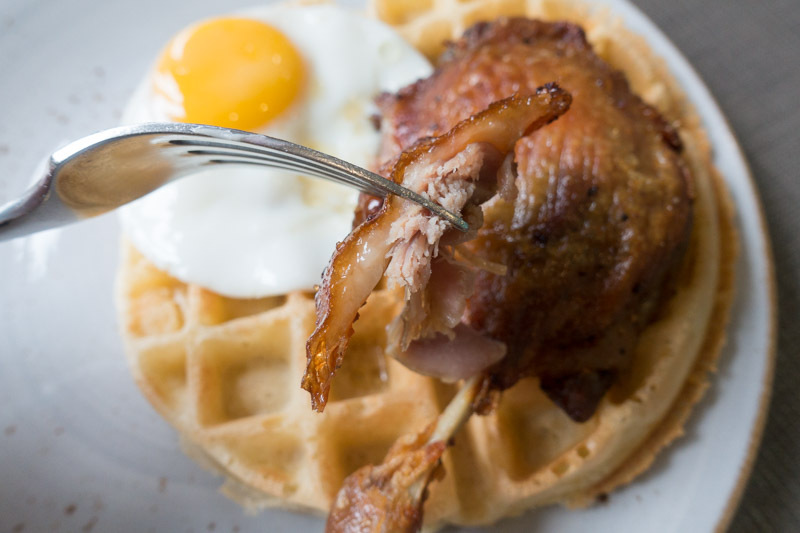 Now you don’t have to travel all the way to London for Duck & Waffle! Served on a golden brown waffle, the hearty whole duck leg was topped off with a sunny side up, and drizzled generously with maple syrup. I’m a huge fan of fried meat with waffles(just like buttermilk chicken waffles), so I was really pleased to try this popular English variant — Duck Confit & Waffle. The duck had a thin layer of fat, as opposed to buttermilk chicken where it’s deep fried and served in huge chunks. Duckland’s rendition of Duck Confit & Waffle was delightfully lighter and yet, still indulgent and delicious. The waffle was on the lighter and fluffier side for me, since I prefer mine a little more crisp and buttery. 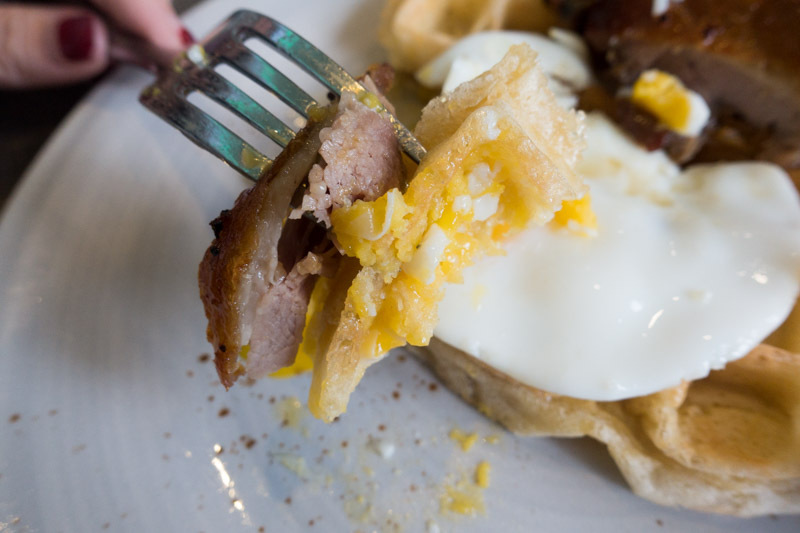 When the waffle soaked up the runny egg yolk, it took on a silky texture. Paired together with the springy and tender duck meat, it made for a heavenly bite, and my dining companions and I quickly polished this plate off. 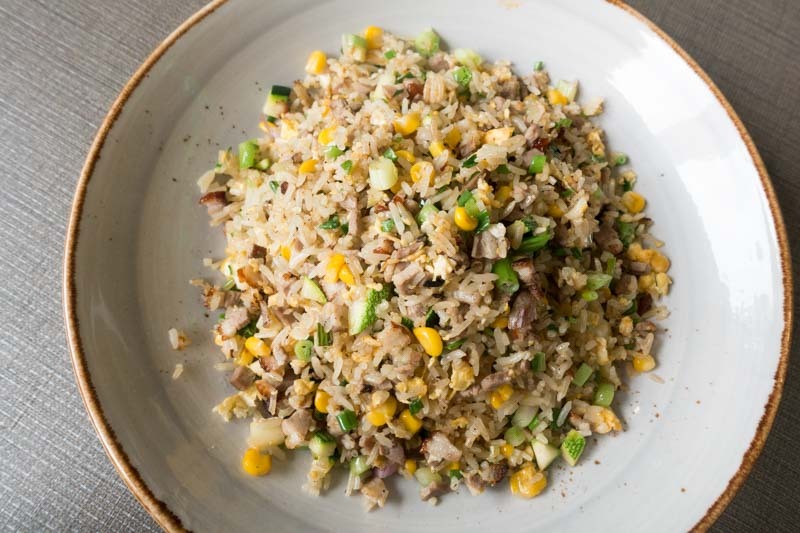 Duckland’s take on a local classic, Duck Fried Rice (S$10) was served with dainty cubes of Irish roast duck, sweet corn, zucchini and garlic. 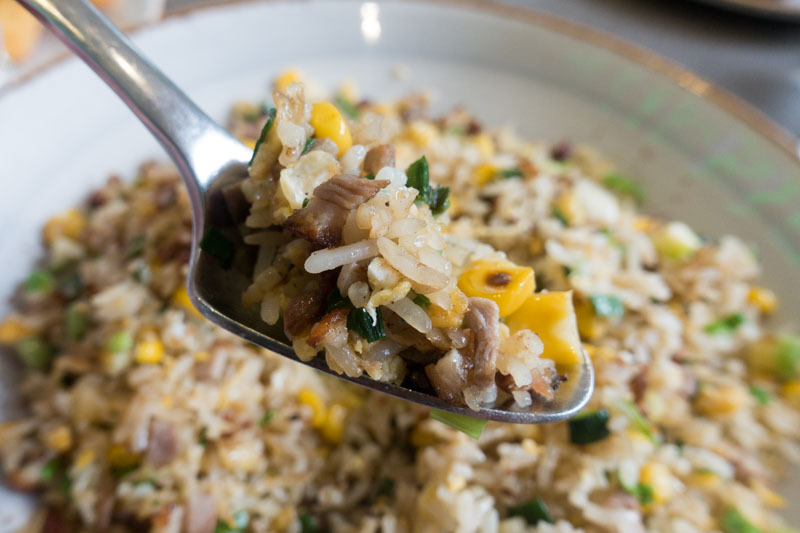 Each spoonful of rice was refreshingly sweet and fragrant, with a strong buttery taste from the charred corn and a slightly nutty aftertaste from the garlic. However, this plate of fried rice was more sweet than savoury, as if not enough salt had been added. Perhaps my palate was more used to savoury fried rice, but I ended up mixing the duck’s soy sauce-based dipping sauce directly into the fried rice. It was also a tad dry, and I could feel each morsel of rice distinctly on my tongue. 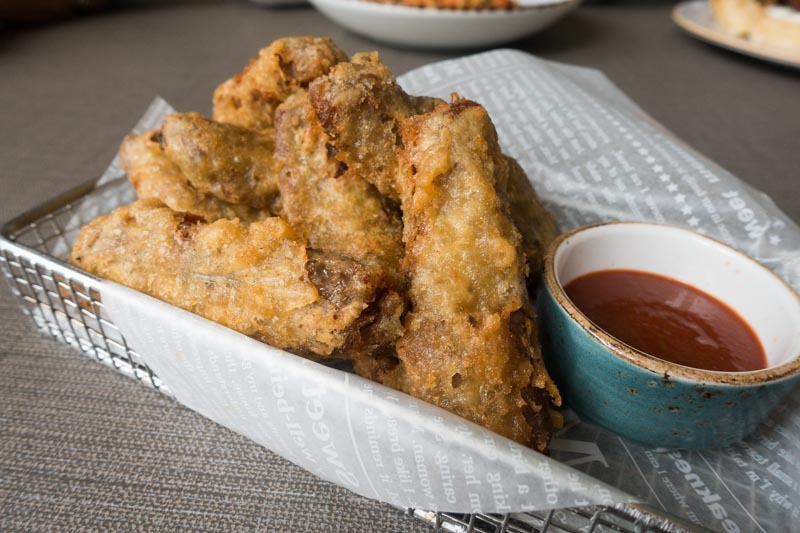 The Crisp-fried Duck Wing (S$8) was coated in beer batter and fried till a thin crisp, and came with a spicy Sriracha-based dip. 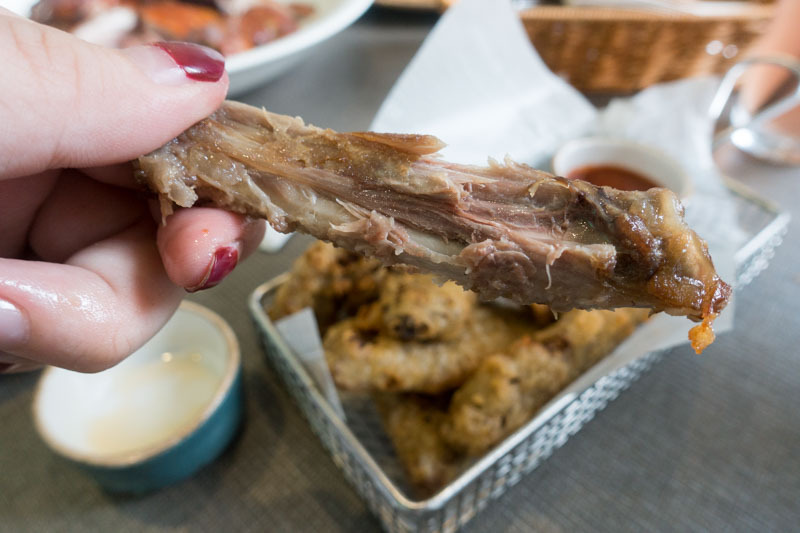 Unfortunately, the duck wings themselves had more bone than meat. That might be because we’re so used to meaty chicken wings, so the small strips of duck meat seem significantly less substantial. Thankfully, the sriracha-based sauce saved the dish. Piquant and sweet, it was jam-packed with flavours thanks to the addition of chilli and garlic. There was a delightful spicy aftertaste as well, which left me reaching for the nearest cup of water. If you’re not one for duck, don’t worry. 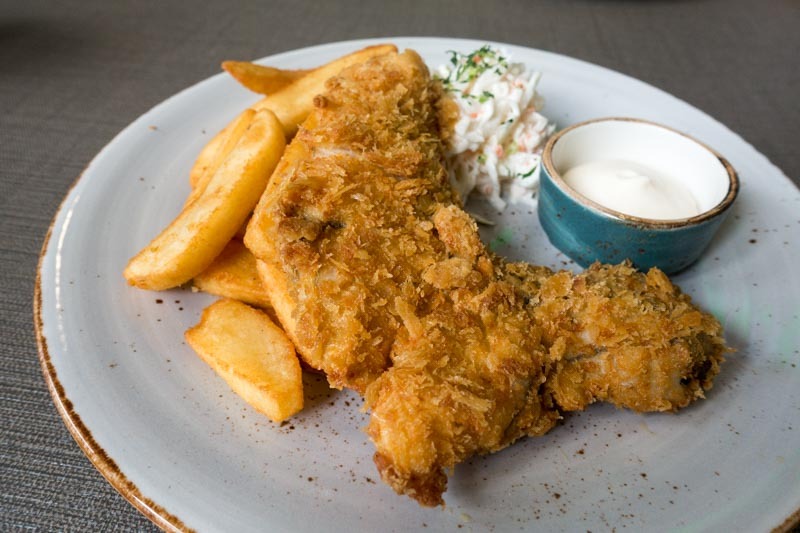 Duckland offers several non-duck dishes too, such as the Good Ol’ Fish & Chips (S$18). 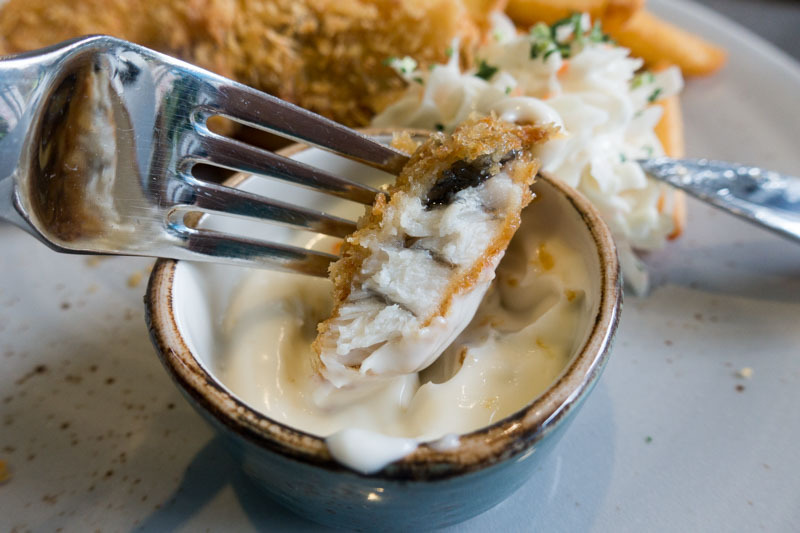 Large pieces of barramundi filets were deep fried till golden brown and served with home-made Japanese mayo tartar sauce and duck fat fries on the side. While the deep-fried barramundi fillets were deliciously crispy on the outside, I was more impressed with the sweet, clean and soft meat on the inside. Evidently fresh, the pieces broke apart easily when I prodded it with my fork. It went hand-in-hand with the house-made tartar sauce, which was creamy, smooth and tangy. Duckland is paradise on Earth for duck lovers. Its Roast Irish Duck was supple, juicy and sweet, and came with a crispy thin layer of glistening skin. 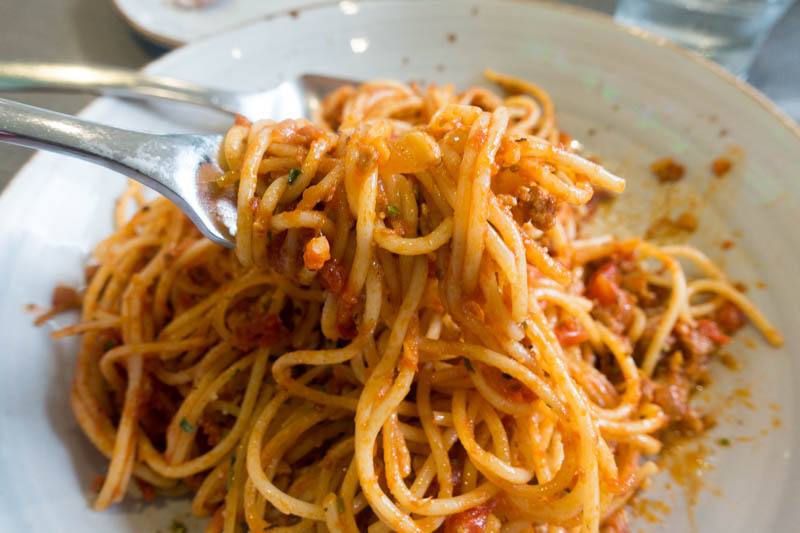 Its other duck dishes were decent too, with my personal favourite being the Spaghetti Duck Bolognese — just because you can’t go wrong with a rustic and hearty plate of pasta bolognese. While the branding of the restaurant and its dishes might be confusing to some, there’s no denying that the food served is absolutely spot on in terms of flavour and quality. Would I come back again? Yes, and I’m bringing a ton of people so we can finish the entire plate of Roast Irish Duck together.